Having a simulator in China? This is one of the main items you want to prepare well. There are a lot of rumors about SIM assessments in China. How to get a good preparation for your simulator check? Keep reading. First of all each Airline has its own profile, however, there are some common Emergencies and Procedures that are always included in the profile. This it is not a walk in the park but it is perfectly manageable to pass. This article will give you concise and detailed information about the main highlights you have to review. Also some tips about peculiarities in China and the Airline. This will improve your preparation and your confidence. There are different Simulator Assessments/checks throughout your Screening Process. 1The first SIM check is done by the Airline and it is usually a straightforward assessment and it will take around 45 mints average per Candidate. 2The second SIM is conducted by a CAAC examiner and it is your ATPL check ride. 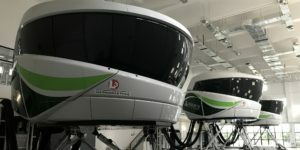 The CAAC SIM is harder than the assessment done by the Airline and it takes a full 4 session for 2 Candidates, however, most of the times it will take less than a full session. 3The third SIM check ride is usually done by a designated CAAC examiner, who belongs to the Airline. The profile of this one is an annual Periodical Check. It is similar to the ATPL but the level of expectation can be a little stricter. Don’t worry you will have 2 simulator training sessions before the check, with an airline instructor together with your simulator partner. Please find below a detailed description of each SIM check. Note: info regarding the SIM checks is based on the usual profiles performed until now. Profiles may differ according to the Airline or examiner criteria. 1 T/O, SEVERE WINDSHEAR (Follow SRS), FLAPS/SLATS FAULT during Retract, ENG FAIL, VOR 36R FULL SELECTED (LAT+VERT), LDG. Chinese Domestic Operations are CAT 1=550mts RVR for LDG/400mts RVR for T/O or Chart Minima if greater. Bear in mind to mention a T/O alternate if before T/O conditions downgrade below 550RVR. WINDSHEAR (SEVERE) btn 200–500 AGL , follow SRS, Keep CONF, Out of W/S alpha floor-TOGA locked, disconnect ATHR, watch out to avoid Flaps Overspeed. Reposition- DOUBLE HYD (G+B) or (G+Y): Get Familiar with this, take a close look at the FCTM, QRH SUMMARIES and ECAM VIDEOS. ILS/VOR APP RWY36 R.LDG Rwy36R ZSSS 25Knots XWIND, Direct Law. Watch the TAP VIDEO, the rhythm should be that: Slow Down and Let your PNF-F/O Read the Paper X-List slowly, make sure you don’t leave any items left (ENG Running, etc) before commencing an EVAC. Take a Look at the FCTM and Operating Techniques. Review the QRH. Demo to STALL, Remember to apply the NEW SOP, Pitch Down until out of STALL conditions, then apply power SMOOTHLY and as needed, avoid getting into a secondary STALL. VISUAL PATTERN, ENG FAIL + ENG FIRE on the Living ENG, continue APP, Notify ATC and Cab Crew at stations, LDG-Stop on RWY, ECAM, EVAC if Req. ILS/VOR 36R, CIRCLING RWY 18L, 2ENGs or 1ENG OUT (QRH X-LIST). Take a look at the Jepessen to see the breaking side after reaching MDA. Scenario: ZSSS 36L, 25 Knots X-WIND, 550 RVR You will have 2 Training Sessions before this Check. The Mandatory Items are the same as your ATPL Check, but the Checkman can be more demanding sometimes, they take into account that you had 2 training sessions. DOUBLE ENG FAIL (Fuel Remaining), Between FL200-FL150 (APU BLEED ON) 1 ENG RELIGHT. 1ENG OUT APP and LDG. 1Don’t panic if there’s no briefing before the SIM, it is normal in China; actually, don’t expect any briefing at all. 2Don’t worry if the CAAC Checkman doesn’t speak English. Sometimes there is a translator, who usually is not a pilot, so take that into account. Even if they don’t speak English they understand it and most can use ATC/aviation English. 3Don’t listen to “Urban Legends” about what they like or not in China. 4Do things the way you’ve always done before, you are already under pressure to try to change your way of flying in one Session. Don’t try to learn the Company SOP’s for the initial SIM’s, you are not supposed to know them, FLY AIRBUS SOP and Callouts. 6Chinese CAAC has mandatory emergency/failures and optional ones like the FAA or JAA. The difference is the number of failures to be performed in a given time. Chinese instructors will combine Failures and Emergencies as much as needed to comply with the mandatory CAAC requirements. 7Be respectful with the Checkman/instructor and NEVER argue with the CAAC Checkman. The door might be half open for you; the moment you argue with the Checkman, you close and lock that door. 8CAAC Checkmen are not picky, focus on the big picture. They want to see skills too but overall they are looking for: Airmanship, Flexibility, Positive Attitude, Leadership and Situational awareness. Coordination with cabin crew is expected, but don’t try to impress with your PA’s or your elaborated briefings. Remember, prepare for the worst, hope for the best!! Just keep it simple and adapt yourself to the environment.